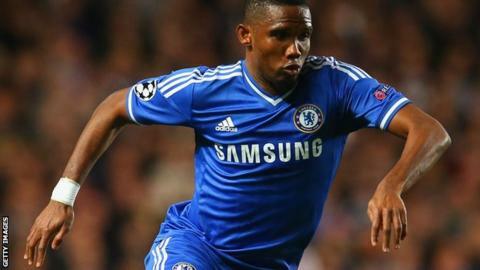 Samuel Eto'o will miss Chelsea's Champions League semi-final first leg against Atletico Madrid with a knee injury. The striker did not travel to Spain with the Blues ahead of Tuesday's meeting with the La Liga leaders. Eto'o scored Chelsea's goal in their 2-1 defeat by Sunderland on Saturday, but was substituted after 74 minutes. However, Eden Hazard has trained following a calf problem that has kept him out of action for nearly two weeks. The Belgium winger, 23, suffered the injury during the early stages of Chelsea's quarter-final victory over Paris St-Germain on 8 April and has not played since. Goalkeeper Petr Cech missed the Sunderland game - Jose Mourinho's first home defeat in 78 Premier League games as Chelsea manager - through illness but is expected to be well enough for the match in the Vicente Calderon Stadium after training as normal. Right-back Branislav Ivanovic is suspended, while midfielders Nemanja Matic and Mohamed Salah are cup-tied. Atletico are free to select goalkeeper Thibaut Courtois, who is on loan from Chelsea. After the two sides were drawn to face each other, the Spanish club were due to pay a fee, reportedly up to £5m, if they picked the Belgian international but Uefa declared the clause in the club's loan agreement "null, void and unenforceable". "I think his state of mind is the same as all other 20 members of the squad," said Atletico coach Diego Simeone of the 21-year-old, who has never played for Chelsea and is spending a third season with the Spanish side. With Eto'o ruled out, Mourinho could select former Atletico striker Fernando Torres, who left his boyhood club to join Liverpool in 2007. "He is a real Atletico supporter, I would say a big one," Mourinho said of the 30-year-old Spaniard. "But I have no doubts that the minutes he is on the pitch he is going to try and do everything for Chelsea. I am not saying that Fernando is going to start, but I am saying that he never hides."